Colostoma cinnabarina: AKA Hot Lips. A puffball. Location: Massanutten Mt Trail, GWNF, VA. Photo by Ken Clark. 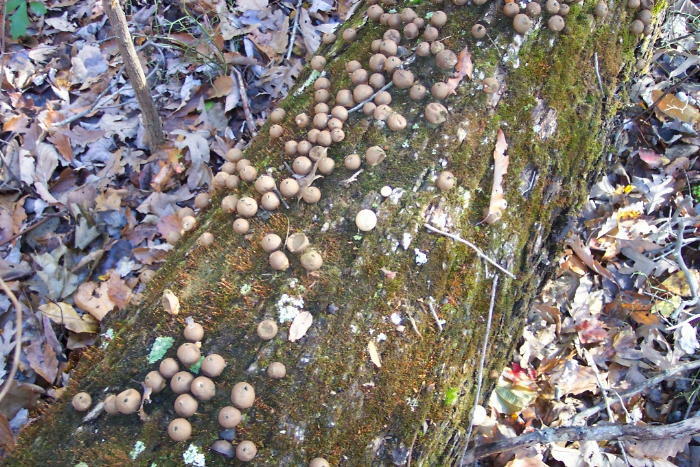 Lycoderdon perlatum: Gem-studded Puffball. Location: Bull Run Mt Conservancy, VA.
Lycoperdon pyriforme: Pear Puffball. Releases fine, powdery, green spores when popped. These spores are called "Devil's Snuff" in the south. Location: Shermans Gap Trail, Massanutten Mt, GWNF, VA.
Scleroderma aurantium: Common Earthball. Poisonous. Purple spores. Location: King's Gap Environmental Education Center, PA.